“I was raped in school. As a result of this, I became pregnant. I was 13 at that time. Then, I was in Junior Secondary School (JSS) two. So I did not know that I was pregnant. When my parents found out that I was pregnant, they told me to go for abortion. “They took me to a particular nurse somewhere in Okobaba, which is close to where we live at Otumara Community at Apapa Road, Ebute Metta, in Lagos. The nurse gave me an injection in her house one Saturday morning. I don’t know what type of injection I was given, but the nurse assured us that the pregnancy would be terminated the next two days – Monday. “That fateful Monday, I was in the bathroom when I passed the foetus. It was like a heavy period, all at once. I lost a lot of blood such that I felt dizzy while walking, yet no medication was given to support me. This was the confession of Esther, (not real name) a 17-years-old girl to Daily Independent. She was spotted recently, at Otumara Community, Apapa area of Lagos where she was spotted begging with a baby at her back. “I was seriously ill after the abortion; that I am alive today is by chance. That is why I have sworn not to go through abortion again in my life. As you can see, I have a new baby,” she further told our correspondent. Many women and girls in Otumara Community are ready to share their stories of abortion as long as their identities are not revealed. This is because of the stigma and misinformation that still surrounds the procedure. Even in countries where abortion has been legal for decades, abortion often remains a controversial subject with those against the procedure giving political, moral, social, ethical and religious reasons. These developments are coming amid anxieties over the impact of reintroduction of the Mexico City Policy, also known as the ‘Global Gag Rule,’ (GGR) by President Donald Trump. In Nigeria, abortion is legal only when performed to save a woman’s life. Still, abortions are common, and most are unsafe because they are done clandestinely, by unskilled providers or both. The Guttmacher Institute 2015 fact sheet shows that unsafe abortion is a major contributor to Nigeria’s high levels of maternal death, ill health and disability. Though Esther is lucky and alive to tell her story, Ukamaka Ndidi was not so fortunate. It was not long after Ukamaka abandoned her live-in lover whom she had two children for that she became pregnant. This time, she could not say exactly who was responsible for the pregnancy. So she opted for an abortion which claimed her life. Both Esther and Ukamaka lived in Otumara Community, before the latter’s death. 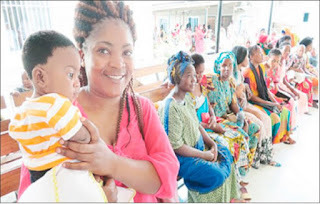 Speaking to Daily Independent was a petty trader, popularly known as ‘Mama Put’ at Otumara Community who complained that abortion is a common thing in the area. Speaking to Daily Independent, Miss Ugomma John, Owner of a private initiative, Maximum Impact, at Otumara Community, said that unplanned pregnancies and unsafe abortion is a common thing in this area. “I grew up in this community and while growing up, we used to wake up to news of abortion in the toilet and children born prematurely and thrown in the dustbin. That was even before I got to know what abortion means. “And as I grew older this ugly scene which reduced last four years is getting escalated. I think something is wrong with the recent escalation. As I speak with you, we have many cases of teenage pregnancies, and most times these girls are secretly made to secure abortion, either by their parents or peers. In spite of Nigeria’s highly restrictive abortion law, an estimated 1.25 million induced abortions occurred in 2012, the Guttmacher Institute 2015 fact sheet stated. It further said, “Most abortions result from unintended pregnancy. Levels of both unintended pregnancy and unsafe abortion could be reduced if the Nigerian government and its local and international partners increased efforts to expand and promote family planning programmes as well as sexuality and family life education throughout the country. “Such programmes should offer high-quality care that includes counseling on a wide range of contraceptive methods and the ability to easily switch methods when needed. Otumara Community represents hundreds of communities in Nigeria, where unsafe abortion is widespread. In view of this, experts said they are “seriously worried,” lamenting that the GGR policy which some have tagged as, ‘Trump’s global assault on family planning,’ is increasing deadly back-street abortions. Reacting on the impact of the GGR on women and girls, Dimos Sakellaridis, the Country Director, DKT International Nigeria, said it is an infringement on their reproductive health and rights as well as a setback on family planning campaign. She predicted that because of Trumps “Global Gag Rule, “The rate of maternal mortality would shoot up and majority would result from unsafe abortion. On his part, Reacting, Professor Innocent Ujah, a Professor of Obstetrics Gynaecology, notes, “Unfortunately, the cut of fund for life-saving services by the US government under the GGR of Trump’s Administration will further worsen the maternal morbidity and mortality indices in all the developing countries of the world, Nigeria, inclusive. Ujah who is also Consultant Obstetrician and Gynaecological Surgeon, in an interview with Daily Independent, faulted the current abortion laws in the country, saying they are very restrictive, as abortion is allowed only to save the life of woman. The don currently with Department Of Obstetrics and Gynaecology, University of Jos and Jos University Teaching Hospital, Jos, Plateau State, regrets, “Unfortunately, many young girls and even married are dying in large number in Nigeria from unsafe abortion that is clandestinely performed by quacks. On his part, a family doctor, Dr Kay Adesola, also shares his opinion on GGR, “Already Nigeria’s maternal mortality rate is very high and the expanded GGR is going to create a huge gap. Hauwa Shekarau, Country Director, Ipas Nigeria, in her paper, titled; Barriers to safe abortion services in Nigeria, says, both the Criminal Code and Penal Code on abortion are restrictive and outdated. Shekarau spoke during a recent training of the Network of Reproductive Health Journalists of Nigeria (NRHJN) in Ibadan, Oyo state. Legally restricting reproductive health services such as abortion does not affect the number of abortions that happen, Shekarau explains. “Legal restrictions on abortion make abortion unsafe, especially for poor women. Where abortion is legal and safe services are available, deaths and disabilities from abortion are greatly reduced,” the Ipas Country Director says. Shekarau cited the statement of Dr. H. Nakajima, Director-General, WHO, 1999, while condemning the country’s restrictive abortion law saying; “Hundreds of pregnant women, alive at sunset last night never saw the sunrise this morning.